The Expendables are back. This time they have youth on their side. No they haven’t gone back in time so Sly, Dolph & Arnie can look like we remember them in their 80s heyday. The first two were great fun. Most of the time silly but they did have huge explosions and great stunts that we expected from the 80s action heroes. Yes, they are now well into their “golden years” as actors. The time when we see other actors their age playing presidents or well intentioned parents or grandparents. This isn’t the case with these elder statesmen of the acting world. They are still running around shooting and blowing things up. With them we do get a younger group. Jason Stathman, Let Ji, Wesley Snipes and Terry Crews. Younger in this case is people born in the 1960s not the 1940s! Not only do the young Expendables bring more of a 21st century view of how things should be done but also speed that their older team members may have lost over the years. With all of that out of the way, what I’m here to show you are two new images that have been released for the film. One shows all of the new team together. The other just shows Sly in a recognisable pose from any of the innumerable action films he’s been in over the last 30, or so, years. Expect more of the same from the gang. This time it seems to be personal so expect a large chunk of back story waffle so we will know why Stonebanks, Mel Gibson, will have to die. Well, die again. 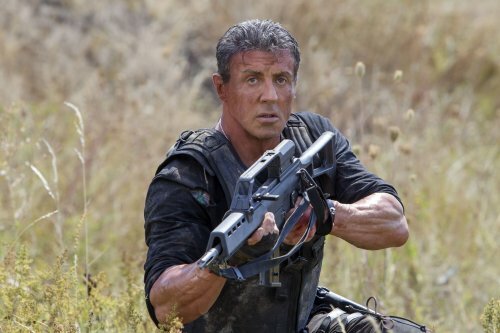 This is, probably, going to be the last of the Expendables films. If it is, expect everyone to go out in a blaze of glory and explosions. I’m going to put my neck out here and say the following – Expect, at the end, either Sly or Arnie will appear to sacrifice themselves to kill our baddie, Stonebanks, only to remarkably survive the enormous explosion that brings the warehouse / aircraft / Tower block that kills our baddie. 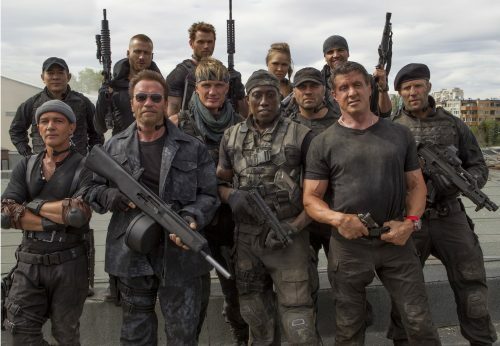 In THE EXPENDABLES 3, Barney, Christmas and the rest of the team comes face-to-face with Conrad Stonebanks, who years ago co-founded The Expendables with Barney. Stonebanks subsequently became a ruthless arms trader and someone who Barney was forced to kill… or so he thought. Stonebanks, who eluded death once before, now is making it his mission to end The Expendables – but Barney has other plans. Barney decides that he has to fight old blood with new blood, and brings in a new era of Expendables team members, recruiting individuals who are younger, faster and more tech-savvy. The latest mission becomes a clash of classic old-school style versus high-tech expertise in the Expendables’ most personal battle yet.